Midsummer & Stonehenge Conflicts | QuantumPhoenix.net – Esoterica, Paganism & Ritual Magic. The Sun’s entered the zodiac sign of Cancer.. 11.09pm GM on 20th June.. which is 00:09 hrs on 21st June (British Summer Time). Happy Solstice wishes to all. These pictures were taken last year, when I went to Stonehenge for Summer Solstice, with my wife April and close pal Marcus. What struck us was the sheer amount of rubbish people were throwing about.. which came to light..once the mass of crowds had greeted the Sun! At the entrance, more or less each person is given a bin bag. And yet, out of the 20,000 or more people who turn up, probably about a handful of them actually keep the place tidy, and put rubbish in bin bags. For our part, April, Marcus & I went around picking rubbish and filling almost 20+ bags, along with the `hired help’ who were also beginning to tidy up after Sun-rise. Beer cans, bits of food, crisp bags, cigarette buts, plastic bags, glass bottles, clothing items..gooey stuff…you name it..it was all there! How utterly disgusting!! We had no gloves, yet were doing our best. What’s mind boggling is, for 363 of the days of the year, English Heritage keeps the stones off-limits to all people, except those who pay hundreds to hire it in the early hours or late hours – before or after tourist times- for small group personal ceremonies. No fires, incense, candles…not even flowers are allowed – lest they hard and erode the stones…in those private hires. Yet, at Summer and Winter Solstices, thousands of people turn up and totally and utterly ABUSE the stones.. from sanding on top to throwing disgusting and dangerous rubbish. And the rest of us – who hold Stonehenge sacred – just have to watch in horror and despair. Free access to he stones is something people fight for – `It’s our right’ many say. But the English Heritage is trying to protect a `world heritage site’- that is thousands of years old. They oblige the campaigns of pressure groups, Druids, pagans and New Agers – and open it up in a limited basis. And thousands abuse and destroy the stones in that shot window. I recall, few years ago, when I first saw the horror of the rubbish, and ill-treatment of the place, that I went around the 4 Quarters, and did a `banishing & closing’ energy work. I actually wanted Stonehenge to be closed for public. But the following year, I felt the errors of my despaired and angered emotions, and did a grounding (not that in between anything changed). I am now just neutral. Yes, the Stones have been here for thousands of years, and yes hey were sacred and people did magical and spiritual works there.. but perhaps they have had their time…and now Stonehenge wants to truly fall apart, rot and be gone – and so the stones have brought about this themselves? Yeah, I know…funny way of looking at it.. – The Stones want to commit Euthanasia. 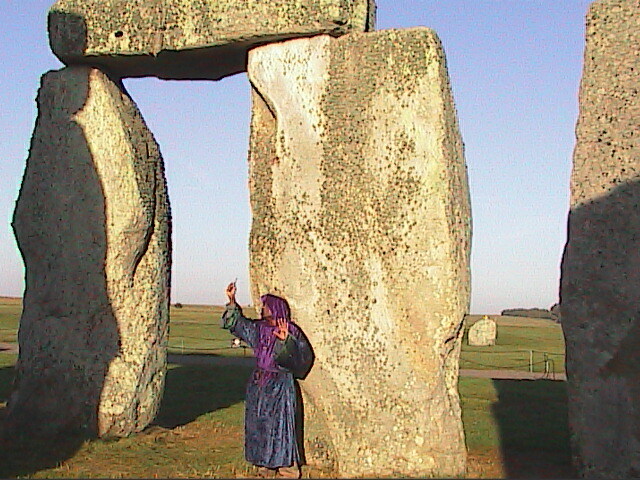 I’ve been lucky – I’ve been to Stonehenge on a few private early morning gatherings – a wiccan coven ritual, a handfasting.. and so on. And I”ve been to the mass gatherings of winter solstice and a few summer solstices too. Sometimes we can’t deal with impending loss – of elderly grandparents about to die, or sacred trees slowly dying, or stone circles – that are being ll treated and will fall very soon.. And when we feel that way, sometimes, we cut ourselves off those things that are dear to our hearts – it’s a way of self-preservation …for us! And maybe I am going through that now..for the Stonehenge. My best memory of it- in the middle of clearing all that rubbish, right in the midst of trampling drunken abusive condescending crowds, I saw a small bunny rabbit hiding right under the central (fallen) altar stone. I smiled, wished it well and safety..and went on. I know it would have stayed safe, and would have come out, once all the 20,000 of us have left! Those stones will fall..and become rubble, dust to dust, and grass and bushes and moss will grow.. Nature will win! Look at photos of 2012 summer solstice, its tidy ,the guy with the windmill done it, did you see him. The stones can always be clean and rubbish free, it only takes one person from beginning to end working throughout the night to do it properly. Who’s is going to help me on summer solstice next year 2013.